Passports are among the most widely accepted forms of identification in the world. One of the reasons for this is that passports are given only after the background of the applicant has been thoroughly verified and his or her bona fides have been established. A key element of the passport as a means of identification is the passport photograph. Very few countries now accept black and white photos for passports and photographs are now starting to be be gathered by some countries in a digital form so that it can be used for computerized facial recognition. The digital photograph is validated against the actual appearance of the person either by a physical verification at the time the passport is collected, or through internal processes and interviews – the procedure varies from country to country but still always requires the validation against an actual passport photo.. The image should be front facing – photos showing profiles or taken from oblique angles are not accepted. The focus must be clear and sharp. The eyes should be open and the ears must be visible- they should not be covered by hair. Teeth should not be visible in the photographs as this will affect the biometric scanning and recognition of the photographs. Biometrics is a technology that more and more countries are using to make, counterfeiting of passports almost impossible and to allow for automated authentication of the passports and recording of the passport holder’s arrivals and departures. A biometric passport is one that adds a remotely readable computer chip to the traditional passport booklet so that it becomes a kind of smartcard. The computer chip stores a great deal of information, but for identification purposes the most important is a digital image of the passport holder. Using this, digital image facial recognition software can be used to verify the identity of the person carrying the passport with a far greater degree of certainty than traditional visual comparison. Children’s photos, especially those of infants are often difficult to take, but again, while specifications may vary according to the country in question, certain basic requirements are common. The baby or child should be clearly visible with the facial details clear. There should be no other objects in the photos –no toys, decorations or other people. The full face must be visible. Both eyes should be open. This condition may be relaxed for infants but is essential in the case of older children for the computerized facial recognition. The United States: 2” x 2” Photos must be less than six months old. Headwear is only allowed id it is a religious requirement. The face must be completely exposed. United Kingdom: 4.5cm x 3.5cm. No “red Eye” is permitted and the photos should not have nay folds or creases. Germany: 4.5cm x 3.5cm. The face and ears must be clearly seen. France: 4.5cm x 3.5cm. Skin tones must be natural and not changed for cosmetic purposes. Wearing of spectacles in the photos is not allowed. ·Russia: 4.5cm x 3.5cm. The head must occupy 75% of the total photo. No light should reflect off spectacles if they are worn in the photos. Netherlands: 4.5cm x 3.5cm. Teeth must not be visible in the photos. Australia: 4.5cm x 3.5cm. The photo should not be more that 6 months old. Singapore: 4.5cm x 3.5cm. Eyes must be wide open. Background should be white unless your hair is of that color in which case a darker background may us used to make the hair visible. Brazil: 7cm x 5cm. The ears must be clearly visible and the face not covered. Please note that the first measurement, in all cases, is the height of the photos and the second is the width. All countries require that the photos be in color and no other person or objects be present in the photos. As can be seen, many countries are standardizing on the 4.5cm x 3.5cm size. However, due to the heightened security measures that all countries are enforcing, it is always best to check from a reliable source and be sure that there have been no changes in the passport photo specifications before applying. Passport photographs are also used for many other applications since the specifications are so strict that they meet most requirements for driving and other license and identity card photographs. The only difference is that the size of the photograph may vary depending on where and for what it is being used. Most countries also require the same size and specification photos both for issuing passport to its citizens’ and also for the issuing of visas to foreign nationals who want to visit the country. This entry was posted in Blogsphere, International, Passport on February 6, 2009 by Maya. Like many other countries, Germany has also adopted the new biometric system that requires a contactless smartcard chip and 13.56 MHz loop antenna embedded into the back cover page. The passport also includes two scanned fingerprints added in the chip. The passport photo specifications must be followed by all passport applicants. The validity period of the German passport for the holders under the age of 24 is now six years, while it is ten years for the older applicants. The cover design for the passport has been accepted to be burgundy red in accordance to the design of other EU passports. The height from top to bottom face must be between 32- 36mm. The photograph should be centrally aligned with a full front view of the face for German passport and visa. All the features from chin to hairline and both sides of the face need to be clearly visible. The whole face is required to be clear, with proper contrast and sharpness. There should be no reflections, shadows, or red eyes visible in the photo. The background of the photo must be uniform and light colored, preferably a neutral grey. There should be no other object or support to the subject in the photograph. The shadows in the background are also not acceptable. There should be neutral face expressions with closed mouth avoiding smile. The subject has to look straight into the camera. Head coverings of any type are not permissible in German passport and visa photographs. The eyes of the subject should be clearly visible, and not covered by hair or frame of the glasses. Sunglasses, tinted glasses, or reflections of glasses are not acceptable in the photos. Passport photos must be printed on high-quality paper. This entry was posted in Biometrics, International, Passport, Passport Photos, Travel on July 11, 2008 by Admin. Whenever the name China appears, we are reminded of a country preserving its tradition, ancient cultures and religion. China is also a country with beautiful landscapes, monasteries, Buddha temples, and martial arts. It is one of the most favored tourist destinations with millions of tourists visiting China every year. However, due to the growing concerns of the security worldwide, the Chinese visa and passport requirements have also changed. Now, the country complies with new biometric standards. No wonder, many Chinese passports or visa applications are rejected due to incorrect passport or visa photographs. * The overall size of the passport photo must be 48mmX33mm taken against a white or light blue background. * The height of head should be between 28mm – 33mm. * The head width has to be between 21mm–24mm. * The validity of passport was 5 years previously, but since the year 2007, it will be valid for 10 years for the people above 16 years of age or more. * Submit the 2X2 inches photograph. * Submit photo with a full frontal view of the face, and taken within last 6 months. It is not allowed to wear hats while posing for the visa photo. The People’s Republic of China does not recognize the dual nationality. For example, if a Chinese national has settled abroad and has acquired the foreign nationality, the person will automatically lose the Chinese nationality. So, a non-Chinese national is not eligible to apply for Chinese Passport or travel documents. This entry was posted in Biometrics, International, Passport, Passport Photos, Travel on July 9, 2008 by Admin. Turkey is a democratic country with huge resources and diversified cultures and climates. The country is known to be a Eurasian nation, as it is located between Europe and Asia. So, it carries the influence of both the continentals. Also, Turkey is a member to many international organizations such as OECD and G 20. This is a growing economy with a large base of industrial and financial institutions. For the people, who want to apply for the Turkish passport have to submit two recent identical photographs measuring 35mm x 45mm of size along with their documents. As far as the non-immigrant visa of Turkey is concerned, one un-retouched photograph of size 2 x 2 inches (5 x 5 cm) has to be produced along with the visa application. The photographs should be a full face photo with applicant facing the camera directly. The face should cover at least 50 percent of area of the photo with a white background. The dark glasses are not acceptable unless for medical reasons. The subject should be dressed in normal street attire wearing no hat, uniforms and no head coverings obscuring the applicant’s features, hair, or hairline. If at all the head covering is essential, the forehead and ears should be completely visible. No border at the frames of the photo is allowed. The photo must be taken with single reflex camera using film required standard processing and hence, the instant-type or digital-quality photograph is not acceptable. Though the guidelines for the photographs required for Turkish passport and visa are very simple to be matched, still you should be careful while getting the photographs printed for the getting Turkish visa or passport. This entry was posted in International, Passport, Passport Photos, Travel on July 7, 2008 by Admin. Canada is one of the most prosperous countries in the world with lots of places worth visiting at least once in a lifetime. Millions of tourists visit Canada every year for different reasons. Canadian visa, immigration, citizenship, and passport requirements are the strictest in the world. So are the photographs requirements for these purposes. The Canadian passport photo requirements strictly mention the procedure for reproduction of the photographs. Two identical colored or black and white photographs produced from the same film or electronic file are required. The maximum size of the photographs is 50 mm x 70 mm on a high quality photographic paper. The photos produced on heavy weight papers are unacceptable. The photograph must be taken by a professional photographer with the stamp revealing his name, business address, and date of the photograph must to be provided at the back of one photograph. Stick-on-labels are not allowed and ample space must be allowed for the name of the applicant, the signature of a guarantor and his declaration below the photographer’s address. Glasses and their frame should not disguise the eyes of the applicant. A neutral expression with no teeth showing with normal skin color has to be maintained. The image of the subject has to be in center of the photo with no shadow on the background and face. The length from the chin to the crown of the head should be 31 mm to 36 mm. The background color required has to be white or light color. No head coverings are allowed unless for the religious cause. The frame size of the Canada passport photo should be 35 mm x 45, with full front view of the head and face placed in the middle of the photograph. The size of the head from chin to crown (top of the head including hair or head covering) must be between 31 mm x 36 mm. Two identical colored or black and white photographs taken within the last six months are to be provided along with the application. The clear, well defined photographs with white or light-colored background have to be printed on quality photographic paper. Subject should neither be frowning nor smiling, has to show neutral face expressions in the photograph. The glasses can be worn unless they do not hide any part of applicant’s eyes and also the sunglasses are not allowed. If a head covering is worn for religious reason, ensure that the full facial features are visible in the photo. Two identical photos with matt finish have to be provided while applying for the Canadian Citizenship. The passport photos have to measure the frame size as 35 mm x 53 mm. The image size should be 35 mm x 43 mm leaving a blank space of 10 mm below the image for a signature. The photograph should include the matt finish with the stamp or write up of the photographer mentioning his name, address, and date of the photo taken on. The requirements of the Canadian immigration photo include some of the most unusual requests that they have to be done on negative film and the applicant has to provide a set of 8 identical colored or black and white photos. The photo must show full frontal view of the subject’s head and top of the shoulders, which have to be centrally aligned. The background of the photo is required to be plain white and the name, date of birth of the applicant and date of the photo was taken on has to be mentioned at the back of one photo of each set. The frame size of the photo is required to be 35 mm x 45 mm, while the distance from chin to the crown of the head is required to be between 25 mm and 35 mm. Each set of photo has to be enclosed in a separate envelope and the name of family members, date of birth and relationship has to be written on the corresponding envelope, which has to be closed by a paper clip. The photo must not be stapled, bent, scratched, and should not bear any ink mark or stain. This entry was posted in Biometrics, International, Passport, Passport Photos, Travel on July 4, 2008 by Admin. According to the GDP calculations, Italy is ranked as world’s 7th largest economy. Moreover, it is the sixth largest exporter of manufactured goods in 2004 as per the OECD. Famous for its ancient culture, traditions, and the religious practices, Italy is a place that attracts many tourists from around the world as it is also an all-time favorite location for the tourists and researchers. Today, Italy is a democratic republic and a one of the most famous world heritage sites that also boasts of a versatile landscape. 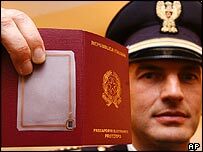 If you are planning to apply for an Italian passport, you have to enclose two identical color photographs of size 30 x 40mm along with other documents. The passport photo should show the frontal view of the subject with a white background. The photographs should not be more than 6 months old. The passport photo specifications are similar to the standards adopted by the European Union (EU). In case you are planning to visit Italy, you need a valid passport except for the citizens of some of the countries such as Argentina, Australia, Brazil, Canada, Switzerland, Chile, Costa Rica, United Kingdom, Japan, New Zealand, Singapore, United States, and Venezuela. The citizens of these countries do not require a visa while entering as a tourist. They just require a document of identification instead of a passport. While applying for a visa to Italy, you have to submit the documents, such as application form, valid passport with one full blank page, as well as the evidence of sufficient funds to support your stay in the country. Apart from these documents, you need to provide one passport-size photograph with the visa application. The photograph for Italy visa must be taken within past six months of applying for the visa, and should be pasted or stapled on the application form. The size of the photo must be 5 cm square (approx. 2 inches) with the head at the center of the frame. The visa photo can be color or black and white, but it needs to be taken against a white background. Head coverings or hats are not acceptable until they are used for religious beliefs. The head covering should not cover any part of applicant's face. One is not allowed to wear sunglasses unless they are recommended for medical reasons, such as an eye patch. Since the passport and visa requirements are liable to change at a short notice, hence the travelers are suggested to check the latest requirements with their respective embassies or consulates. This entry was posted in Biometrics, International, Passport, Passport Photos, Travel on July 1, 2008 by Admin. In case of applying for a travel certificate, two colored identical photographs have to be submitted all other requirements being similar to the photographs for new passport. Beside passport photographs, all applicants are required to furnish their exact residential number of Korea along with their permanent residential address in country. Otherwise, they are required to submit their Family Census Register. Male applicants between the ages of 18 and 35 years have to submit the proof of extension from military services. However, those who have completed their military service are not required to submit this document. If you are applying by mail, you are required to send the application enclosed with all documents and a stamped envelope with a return address. Do not forget to mention your preferred mailing service for the secure arrival of your passport. If you are a foreign national and want to apply for Korean visa, you have to furnish one recent colored photograph measuring 2”X2” along with copy of your passport and other documents. This entry was posted in Biometrics, International, Passport, Passport Photos, Travel on June 27, 2008 by Admin. The Dutch passports are valid for a period of five years from the date of issue. The rules complied by the Dutch passports are similar to those of the European Union. All passports include an embedded contactless smartcard RFID chip for storing biometric data since August 26, 2006. The requirements for the passport photo are one of the strictest and the most difficult to be followed or produced. The Dutch government has issued clear guidelines if how the photograph has to be produced for the purpose of passport. 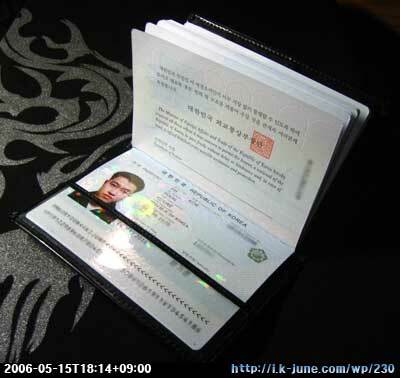 The passport photograph must be recently pictured, which is not more than six months old. The size of the photograph must be at least 2”X2” in measurement with a plain, uniform, light gray background. The length of the face of adults, from the chin to crown of head must be 26mm to 30mm. while in case of children aged 11 or below, the length of the face is required to be between 19mm to 30mm. The distance from one ear to another has to be between 16 mm to 20 mm for the adults. In case of children also, the distance from one ear to the other is same. The head of the subject is needed to be in the middle of the photograph. Though, the glasses can be put on, but generally it is advisable not to wear the glasses. Shadows across the face or on the background are not permissible. Hats and scarves are allowed for religious purpose. Any kind of support even to the children is not permissible. The requirements for the visa photograph by the Netherlands consulate are specific. The size of the photograph should be 2”X2” and the recent photograph must not be 6 months old. The face of the subject should cover at least 50 percent of the area with the head at the center of the photograph. The full face front view of the applicant should face the camera directly. The color photograph should have a white background with both ears visible in color. Sunglasses or other wears are not acceptable unless required for the medical reasons, for example, an eye patch. Any person wearing a traditional facemask or veil that prevents the adequate identification is not allowed. This entry was posted in Biometrics, Free, International, Passport, Passport Photos, Travel on June 24, 2008 by Admin. The country with rich cultural and traditional values is also famous for its festivals and carnivals. The specifications of the Brazilian passport and visa are unusual and unique in the world. Thus, you have to be very careful while selecting a studio for a shoot up for the passport and visa photos. Although, different Brazilian consulate specify different criteria time to time but the common specifications are as given below. While, applying for a Brazilian passport 3 identical and recent photos of size measuring 5×7 cm are to be submitted along with the passport application. The full front view with light background color has to be shown. The passport booth instant photos are not accepted for the passport. The photograph requires a date to be shown on the photo, but the digitally added dates are not acceptable. Brazilian passport & visa photo are similar to the US visa standards. The photos for the Brazilian visa should be recently taken with a measurement of 2” x 2”. The photo should show the front view of the face. The background of the photos should be white. The snapshots and computer pictures are not allowed. Though, these specifications are the most recent, still you should confirm the specifications for the photographs while applying for the Brazilian passport and visa. There are many countries of the world, whose citizens do not require the visa to visit Brazil, such as Belgium, Bolivia, Ecuador, France, Finland, Malaysia, Spain, Sweden, and Turkey. This entry was posted in Biometrics, Free, International, Passport, Passport Photos, Travel on June 22, 2008 by Admin. So you have decided to apply for a passport for your newborn? Many of you would agree that it’s quite challenging to take good shots of such young babies. This is because newborns often fall asleep during a passport photography session. Though getting a passport photo of your child can be a tiresome job, but you won’t be able to resist smiling when you recollect these small but important moments of his childhood. Therefore, if you want to succeed in getting a beautiful picture of your child, you should consider each step of getting a good passport photo for your child as a step towards attaining his true identification in this world. 1) Ensure that the child has got a good amount of sleep before you take him for a passport photo session. The baby must be in good mood with his eyes open. 2) The background of the passport photo should be white. Therefore, you should dress up the baby in contrasting color, which doesn’t blend much with the background color. 3) Keep the copy of your baby’s birth certificate and his social security card handy. 4) Babies may get cranky during passport photo session, so you should immediately take a break. Feed the baby if he is hungry, but you can use a bright colored toy to ensure he doesn’t fall asleep. 5) If the baby is too young to hold his head straight, you can make him lie on a white cardboard and shoot a nice passport photo. You can also put the child in his car seat and put a white towel around him and then take the passport photo. 6) Always check the passport rules set by government authority, it would help you take the desired shot without wasting much of your time and keeping the child calm. 7) Parents should not try to support the child by putting their hand or holding the child from the back side. 8) Don’t put any toys or dummies to console the child, which are visible through camera. 9) The passport photograph of your child should look identical and should be printed on a low-gloss, plain white paper. 10) The passport photo of your child should be in sharp focus and should be devoid of any unwanted shadow at the background. This entry was posted in Baby, International, Passport, Passport Photos, Travel on April 2, 2008 by Admin. Why do you need extra passport photos handy? While traveling abroad, you must carry extra passport photos with you. This is because you are required to submit passport photos for a Visa or for any other application forms. If you have extra passport photos handy, you can save both- money as well as time. Therefore, it’s a good idea to keep the passport photos with you while visiting any other country. You must check the passport photo guidelines of the country you are traveling to and ensure that you follow them. If you are really looking for an economical solution, you can get few passport photos printed using your home-printer. In case you are doubtful about the size of passport photos you should carry with you, log on to ePassportPhoto, and select country-specific dimensions to print your photos. If you can experiment with your passport photos by using Photoshop, you can try another interesting option. You can get your passport photos converted into business cards. This means that you can put your passport photo on a business card while including business-related information, such as name, home address, e-mail address, and your mobile phone number. You can even print these business cards at home by using inkjet photo printer. This business card would serve two purposes. Firstly, you can give them to your business associates and they would remember you due to your passport photo. Secondly, you have a passport photo handy if you require it for getting passport, visa, company, bank or tourist passes. You can simply staple the entire card to the application or cut it out to submit along with an application form. If you want, you can also put your passport number on business card – without specifying that it belongs to your passport. You are required to mention your passport number to the hotel where you stay in. If you want to conceal the passport number, you can add null numbers or alphabets either at the beginning or towards the end of the passport number printed on your business card. This entry was posted in International, Passport, Passport Photos, Travel on March 10, 2008 by Admin.